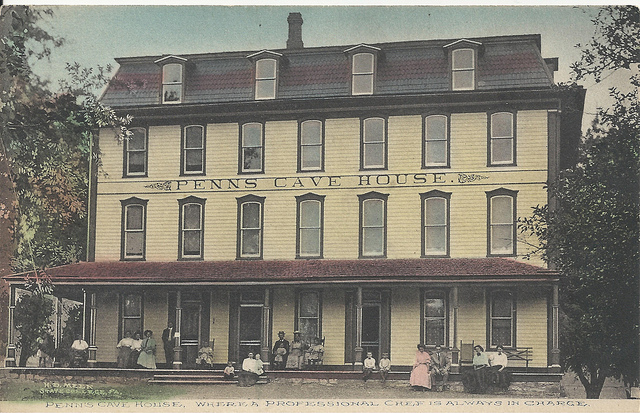 Notes: The caves are part of a tourist attraction, the old Hotel is now a privet Residence. A few miles north of Lewistown, in Centre county, there is a hole in the ground, which fills with water. It fills with so much water that it is Navigable and is also the start of Penn's Creek. Of course besides being a natural wonder, there is a legend. In the early eighteenth century, long before settlements reached west of Sunbury, PA, a young Frenchmen from Lancaster County, Malachi Boyer, set out to explore the wilderness. He roamed into the forests peopled by redskins, with whom he was friendly. One beautiful April, Malachi was camped at Mammoth Spring, near the Indian camp of Chief O-Ko-Cho, on the shores of Spring Creek near Bellefonte. He made friends with the old chief and sent him small gifts as tokens of friendship. O-Ko-Cho had seven sons and one beautiful daughter, Nita-nee, whom the sons guarded carefully all the time. One day Malachi caught sight of Nita-nee washing a deerskin in the stream and immediately fell in love with her. Since the Indians would not permit their marriage, they decided to run away, and late one night, they departed for the eastern settlements. They were later captured by the seven brothers and were returned to Chief O-Ko-Cho. O-Ko-Cho commanded his sons to take Malachi into a yawning cavern filled with water and thrust him in. Every day for a week he swam back and forth searching vainly for an entrance other than the large one guarded by the merciless Indians. Then exhausted by his efforts and vowing that the Indians should not see him die, he crawled into one of the furthermost recesses of the cavern and breathed his last. The brothers did not touch the body except to weight it with stones and drop it in the deepest water in the cavern. After these many years, those who have heard the legend declare that on still summer nights an unaccountable echo still rings through the cavern which sounds like "Nita-nee -- Nita-nee". We at nightWatch have been to the caves with a girl scout troop, the tour boats hold 22 passengers at a time.... so as you can guess, we were unable to hear any echos attributed to any man, french or otherwise. The Caves themselves without a story of the paranormal are amazing. They are well worth a visit. Prior to the interstate road system this attraction was so popular, they had their own stagecoach and later their own rail road. Now there are also other attractions at the location to make a day trip. There is a hotel still standing that was built in 1885 as well on the property. It was recently used as a private residence in the 1980's, however now the first 2 floors are used for offices and the like. We would love to check out he cave and old hotel. If anyone out there, guest, visitor or former employee have any tales to tell, please share them with us.